2018-19 Yearbook sales will be open January 11, 2019 through February 13th. $25 per book includes MN sales tax and iTag (name tag). An order form will be in the January Gray Envelope (January 11). Need an additional form? Click the PDF version in the box below. Order forms and payments will be collected in the Library Media Center outside of Mr. Peterson's office. Online credit card sales will be available but does require a $1.25 convenience fee. See box to the right. An email from Walsworth or Mr. Peterson is your receipt of sale. Please save the email until yearbooks are delivered. In November Mr. Peterson will be recruiting six students to form the Yearbook team--layout pages, select cover, etc. If you miss the sales window (1/11 - 2/13), the next opportunity to purchase will be June 3 and 4. $30 cash or check on a first come, first served basis (8th graders on June 3th and grades 6 and 7 on June 4th). 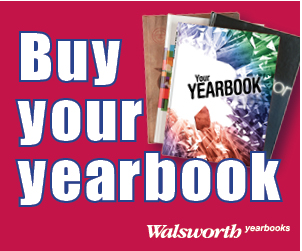 Yearbooks can be ordered online from January 11 to February 13. A $1.25 convience fee will be added to the $25 book charge. Walsworth will email a receipt when the order is complete. Be sure to fill out the the student name section under the Personalize area for the free iTag: Student's name will be applied to the cover. There are additional options icons that can only be ordered online at additional cost. Need an order form? Print the PDF form below or stop in the LMC there should be a few available by the order form collection box. JMS 2018-19 Yearbook order Form.